Antoni van Leeuwenhoek (1632-1723) was the first person able to grind simple lenses and who built the first microscopes (Fig. 1.9). The biconvex lens (L) was fastened between two thin metal plates and the object was mounted up on the pin at (P), which was adjustable by moving two screws. He constructed many of these microscopes and all the necessary lenses he ground himself. The best of them magnified about 200 times (Burdon and Williams 1969). With these instruments, he patiently examined numerous natural objects. Fig. 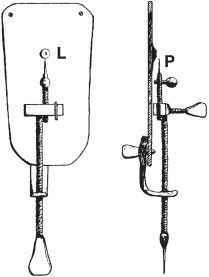 1.9 Front and side views of one of van Leeuwenhoek's microscopes. A lens was fastened between two thin plates at L, and the object was fixed upon the adjustable pin at P. The microscope must be held very close to the eye (Burdon and Williams 1969). Fig. 1.10 Van Leeuwenhoek's drawing of bacteria in a letter of 1683 to the Royal Society of London (Mockmann and Köhler 1996). the following decades only a few microscopes similar to that of Fig. 1.9 were available. In 1720, an important book was published in London with the title "A new theory of consumption: more specifically on a Phthisis, or consumption of the lungs", written by Benjamin Marten. In contrast to numerous other hypotheses, the cause of the consumption (tuberculosis) was attributed by Marten to small animalcules (microorganisms), which may come in the lungs by the circulation of blood. They may be contained in the air, can be breathed in and can grow in the blood and the lungs. However, the scholars of that time believed in a phenomenon which was called abiogenesis. This theory of abiogenesis, or "generatio spontanea" (spontaneous generation of living organisms), is an old hypothesis and was not limited to animalcules. The famous alchemist Johann Babtist von Helmont (1577-1644) thought that animals like the mouse, worms and insects could be created by abio-genesis (Helmont 1652). This period was concluded in part by experiments, carried out by Franceso Redi (Redi 1667), who worked as a personal physician of Ferdinand II de Medici (the grand duke of Toscana). He distributed a snake, some fish, eels and plates of veal into four bottles and closed them with fine porous gauze. The same remains of these animals were placed into open vessels, in which maggots were living after short time, having developed from eggs which were deposited by flies. In the covered bottles no maggots developed. The abiogenesis of insects had already been refuted and scholars did not perpetuate this idea, but the discussion of abiogenesis started again in connection with animalcules. In their opinion, they must have been produced by abiogenesis. In 1711, Louse Joblot studied the development of animalcules in hay and water suspensions (Joblot 1718). First, it was boiled for 15 min and distributed into two vessels. One of them was left open and, after some days, many animalcules had grown. The second vessel was closed with moist, oil-impregnated paper. No life could be observed in this vessel. Only after opening the vessel and waiting for some days did the same effect of growing life present itself, probably observed by using van Leeuwenhoek's microscope. But we can assume that he was not able to observe bacteria. After these experiments, Joblot was convinced that the observed animalcules were descended from small animals living in the air. The English priest Father John Turberville Needham (1713-1781) tried to refute this opinion experimentally. He was a resolute advocate of abiogenesis. In order to support this hypothesis, he boiled a suspension of mutton meat, bottled it and sealed the flask from the air with a cork. After some days, the suspension was full of living things. Needham and many other scientists were sure that the theory of preformation was conclusively refuted (Needham 1749, 1750). (1 h) into vessels, which were closed carefully afterwards (Spallanzani 1765). All mixtures remained sterile. Needham revised this theory: during a heating time of 1 h, a "vegetative power" would be destroyed, which was now introduced into this discussion instead of a biogenesis. Spallanzani (1776) carried out further experiments in 1776 to test the existence of a "vegetative power". He boiled different infusions, filled them into vessels, closed them and boiled them again for 0.5, 1.0, 1.5 and 2.0 h. Half of them were opened, half of them remained closed. Only in the opened vessels were animalcules observed to be growing. Therefore, a "vegetative power" which could be destroyed after boiling for 1 h could not exist. 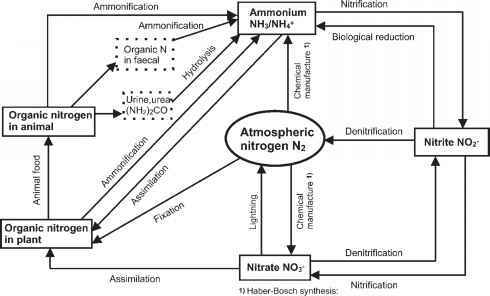 Nevertheless, the idea of abiogenesis or generatio spontanea (heterogenesis) as a model for the origin of life from nonliving organics remained a popular theory until 1830. At this point in time, it was shaken more and more by further experiments. Franz Schulze filled water, meat and vegetables into a glass. At both ends of the glass, vessels were attached which were filled with sulfuric acid (Schulze 1836). From time to time, air was blown into the system (Fig. 1.11a), but all animalcules were restrained and killed off by the strong acid. The organics remained unchanged, no organism was alive. Only after the vessels filled with H2SO4 were removed did the animalcules penetrate from the air into the flask. 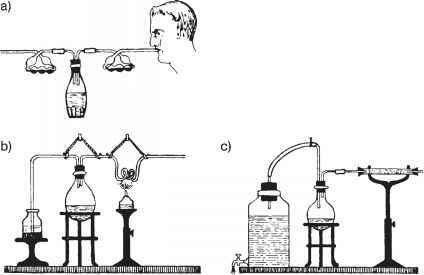 Schulze proved with this experiment that germs (molecules or particles) distributed in the air of his breath were retained by washing in H2SO4, but that they started to digest the organics after entering the open glass. One year later, Theodor Schwann (1837a) demonstrated that germs could be destroyed by heat. The left bottle in Fig. 1.11b was filled with a heated infusion and connected with a large spherical bottle and a helical tube. Both were heated and the right tube was closed by melting. The organics remained sterile. Obviously, the germs (molecules or particles) could be destroyed by higher temperature. Schroder and von Dusch (1854) successfully used a layer of cotton as a filter for sterilization (Fig. 1.11c). First, the organic substance in the middle glass was heated and after that a flow of air was adjusted by opening the tap and emptying the left, large bottle slowly. Since then, layers of cotton have been used frequently to sterilize air in microbiology and biotechnology. Schwann had shown already in 1837 that yeasts are living organisms and that if they grow in aqueous sugar solution and in the absence of oxygen, the sugar is converted to ethanol (Schwann 1837b). This interpretation of fermentation was doubted by scientists over the next 20 years: the conversion of sugar into ethanol must be a purely chemical process! Fig. 1.11 Early experiments showing activities of microorganisms. (a) Franz Schulze's experiment with a heated suspension of meat and vegetables in the bottle and H2SO4 in both glasses (Schulze 1836). (b) Theodor Schwann's experiment with a heated glass spiral (Schwann 1837a, b). (c) The Schröder and von Dusch experiment with a glass tube filled with cotton (Schröder and von Dusch 1854). gy, which gained considerably in importance during the following decades. In the next years, Pasteur studied the causes of "wine and beer diseases" (Pasteur 1876) as well as poultry pestilence (Pasteur 1880a), anthrax (Pasteur 1880 b) and rabies (Pasteur 1885). All these works laid the foundation for medical bacteriology.